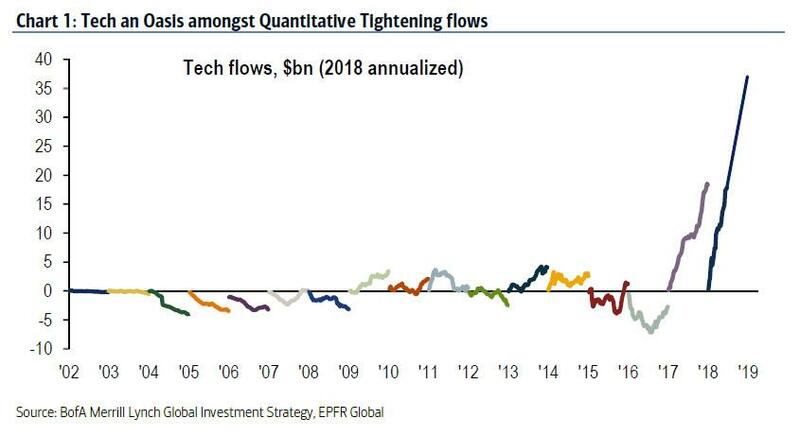 One week after the second biggest ever weekly tech inflows, in Bank of America's latest weekly fund flow report, CIO Michael Hartnett shows what the annualized tech inflows in 2018 look like, and it is surely a surreal sight for an entire generation of traders, as the last time we observed such sheer uniform panic to plow cash into tech names was just before the dot com bubble... only this time it's even worse, as the annualized inflows into tech have never been greater, and as shown below, are now almost "off the chart." 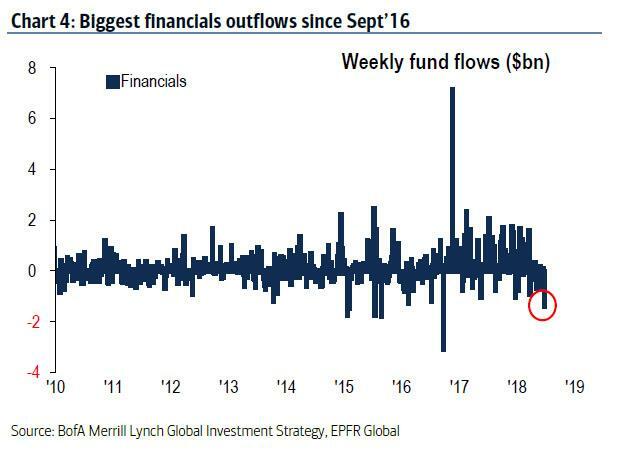 What is odd, is that while traders, investors, algos and passive capital allocators are flooding the FAANGs with money, virtually every other sector is hurting, iin what BofA definies as "Risk-off flows" after $12.9bn pulled out of equities, $5.9bn out of bonds, and $0.8bn out of gold. ... while the latest $2.7bn in outflows out of Europe makes it $38.6bn over the past 15 weeks, $1.9bn out of Japan. 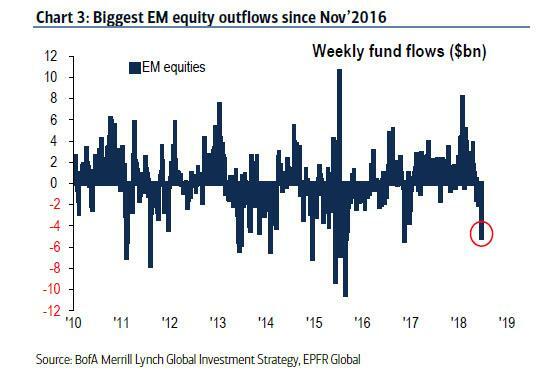 ... but spread to other asset classes as well, with the highest outflows from IG since Dec. 2016, or some $2.6 billion. ... with just tech stocks sticking out as the "anomaly", but as Hartnett notes, those are increasingly "vulnerable to investor deleveraging." Finally, as BofA adds, it remain bearish until then there is a clear break in SPX below important 2650 level.